The University Choir, comprised of over 300 voices, surged through “Do you Hear the People Sing,” letting the final chord soar through the music hall into silence before carrying on with rehearsal. During Homecoming weekend, the choir will combine with traveling tenors, local alumni and the Liberty University Symphony Orchestra for a concert of Broadway classics. standards from musicals such as “My Fair Lady” and “West Side Story.” Amerson has sung for almost 200 movies including “La La Land,” “Star Wars: Rogue One” and “Aladdin.” He also lends his tenor to ministries and churches across the globe. LU Praise joined his Christmas at the Capitol concert in December. Whaley said students rarely get to work with performers of this quality. The School of Music has nine choirs, and their rehearsals often reverberate through the walls and mix in the halls at the music building. They will combine to provide stirring, soaring accompaniment along with the Liberty University Symphony Orchestra, all conducted by Dr. Kathryn Voelker. Daniel Gray, a senior worship studies major who will sing in the choir, praised Voelker’s skill and passion. Sarah Day, a senior studying choral music education, sings with the a capella group LU Shine and the University Chorale. She will also sing for Amerson in a small masterclass the day before the concert. Day has been polishing a song from “Shrek: The Musical” and looks forward to an impartial, professional perspective. As the choir rehearsed behind him, Gray encouraged community members to attend the concert and anticipated the unique energy of so many musicians collaborating. “There’s a real electricity that comes from everybody being together,” Gray said. 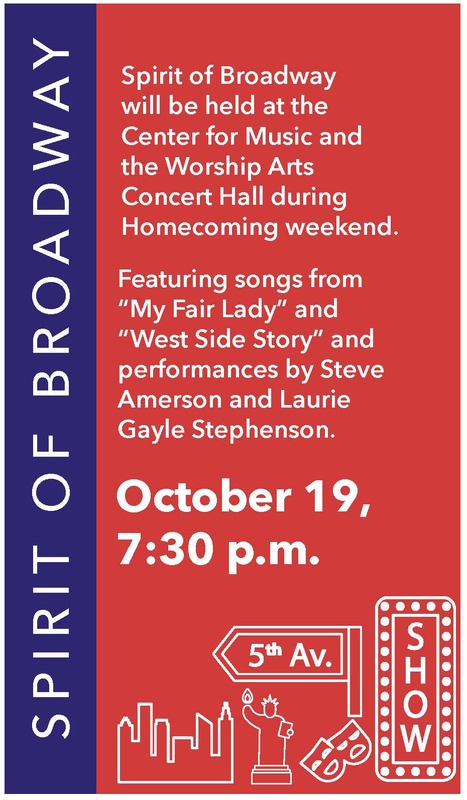 The Spirit of Broadway concert will be held Oct. 19 at 7:30 p.m. in the Center for Music and the Worship Arts Concert Hall. Tickets can be purchased by calling (434) 582-SEAT.